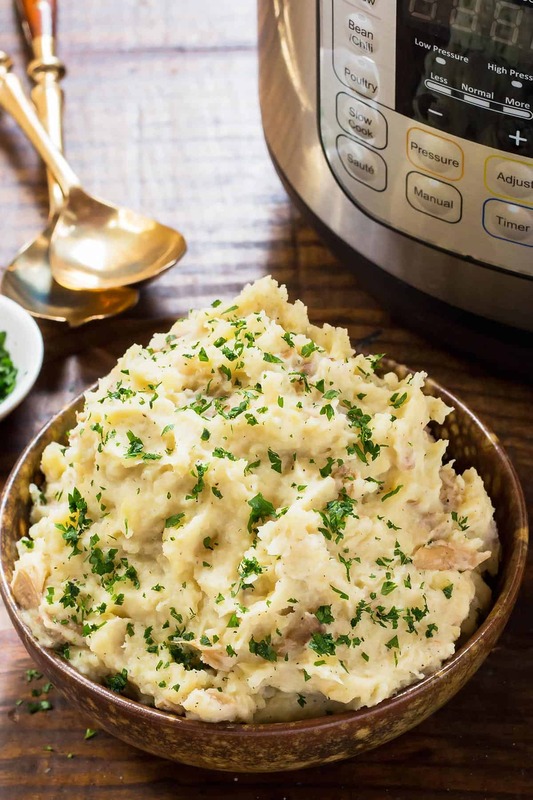 These Restaurant-Style Instant Pot Mashed Potatoes make a perfect side dish for the holidays (or any other time). Roasted garlic gives them an amazing rustic flavor and thanks to the keep warm function these can even be easy make ahead mashed potatoes. What would the holidays be without mashed potatoes?? I couldn’t even imagine. But outside of the holiday season we don’t actually make mashed potatoes all that often. Growing up my husband despised potatoes. He blames having had plain boiled potatoes too often as a child. Nowadays he has come to enjoy potatoes, especially flavorful mashed potatoes. But when contemplating what side dish to make, mashed potatoes rarely come to mind for him. Our 3-year-old daughter seems to go after him. For some reason she isn’t a huge fan of potatoes. So they just don’t happen too often at our house. 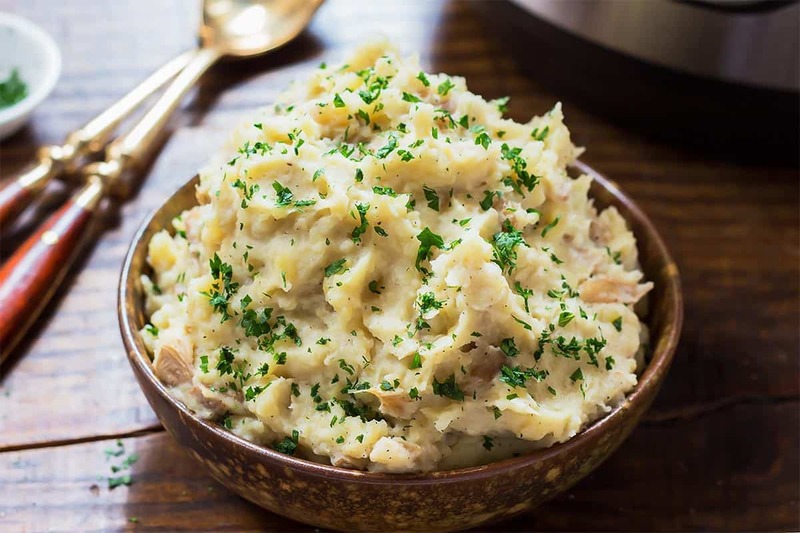 But now that I have discovered Instant Pot mashed potatoes they just may have to happen a whole lot more! And I’ll definitely never make stovetop mashed potatoes for the holidays ever again. I love that I can just throw in the potatoes and walk away while they cook without any danger of boiling over. Once the potatoes are all mashed up and ready, I can just leave them in the Instant Pot on the ‘Keep Warm’ function until ready to serve! That means I can make them ahead and then focus on all the other dishes that are happening. 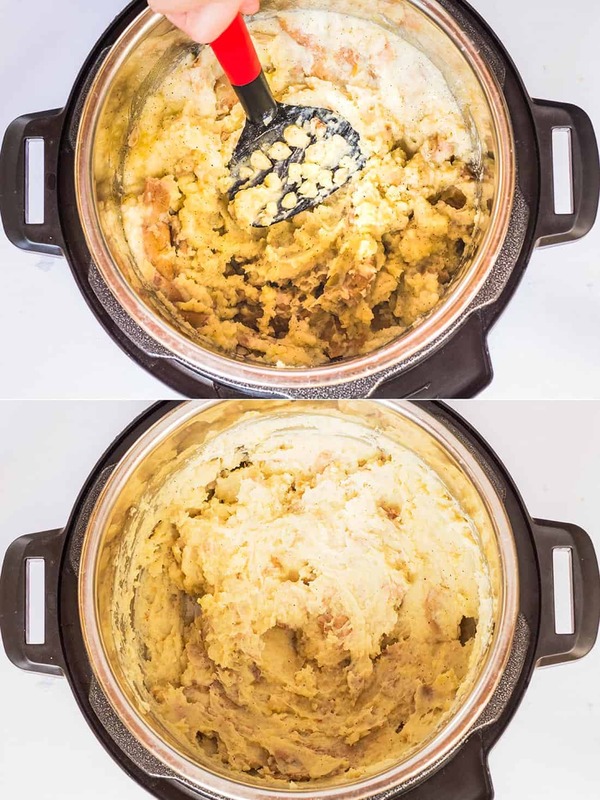 In total my mashed potatoes in the pressure cooker too about 30 minutes of cooking time: 10 minutes to come up to pressure + 10 minutes high pressure cooking time + 10 minutes NPR (Natural Pressure Release). So there may not be any actual time saving with the pressure cooking method, but the hands-off and make-ahead option is absolutely priceless to me. 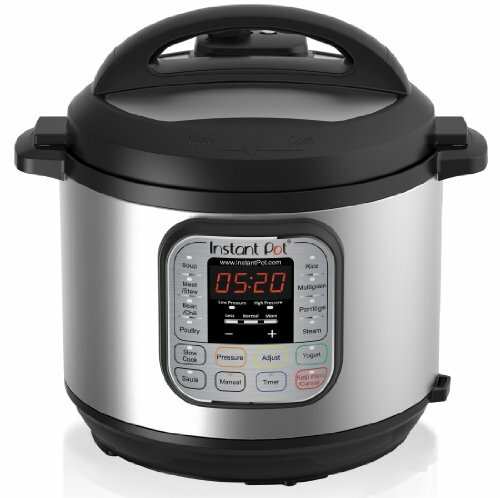 If you don’t already own an Instant Pot you can usually get the best deal on Amazon. I am not saying everyone needs to have one, but it’s worth looking into. I believe there are varying opinions on what makes mashed potatoes ‘restaurant-style’. My first memorable mashed potatoes at a restaurant were rustic with small pieces of red peel and a pungent dose of garlic. I liked the extra texture and later I learnt that leaving the peel on means more healthy fiber, but I wasn’t a fan of that much raw garlic. So for my version of pressure cooker mashed potatoes I use roasted garlic. You don’t need to use any garlic at all, but I highly recommend these roasted garlic mashed potatoes. It is amazing how roasting the whole head of garlic with just a little olive oil turns its pungency into mild and aromatic sweetness. So yes, there is a whole head of garlic in this recipe, but you won’t be scaring away vampires afterwards. 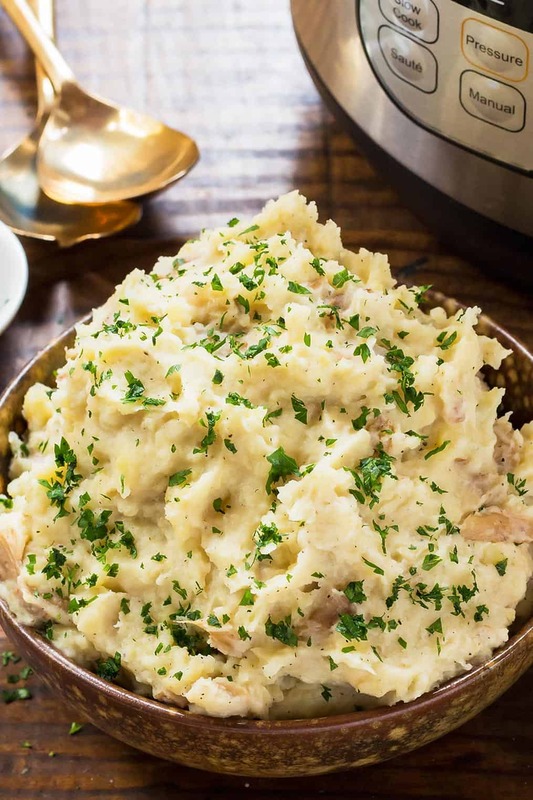 Usually high-starch Russet or baking potatoes are recommend for making fluffy mashed potatoes. While I don’t disagree, these starchy potatoes also have a really thick skin. So you HAVE to peel them for mashed potatoes. And because they are cooked whole and with skin-on the potatoes are less likely to be overcooked. 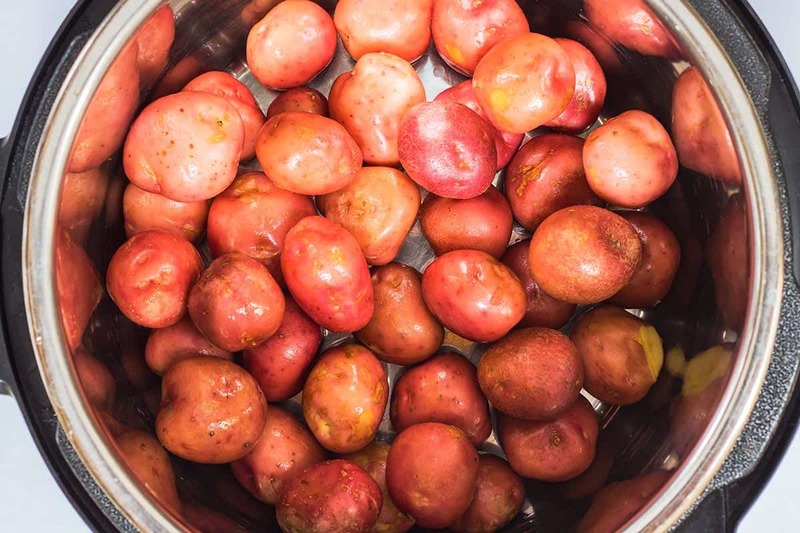 Overcooked potatoes release more starch and can end up in gummy, gluey mashed potatoes. We’ve moved houses A LOT over the last 6 years. And with every move I tried to condense our belongings down to just the essentials (so I wouldn’t have to move so much stuff the next time). At some point I must have gotten rid of our potato masher. As I mentioned before, aside from the holiday season we don’t even have mashed potatoes that often. Well, the next time I wanted to make shepherd’s pie, I had the genius idea to mash the potatoes in a blender (since there was no masher to be found). My oh my, there was nothing genius about this. I ended up with a very unappetizing gluey, slimy substance that no one wanted to eat! Since then I have learnt that you never want to over-agitate the starches when making mashed potatoes. So don’t EVER use a blender or food processor. You could use a handheld or stand-mixer, but even those are too risky for me. I never again want to end up with potato glue. So I went out and got us another handheld potato masher. Sure, it may take a little more upper body strength and time, but we already saved some by not needing to peel or cut up the potatoes. Perfectly fluffy potatoes are worth that little extra effort. I have never owned or even use a potato ricer, but apparently those are great for fluffy, non-gluey mashed potatoes, too and can also be used with unpeeled potatoes. You’ll even avoid the occasional lumpy bit that usually gets missed by a handheld potato masher. How much mashed potatoes per person do I need? The general advice usually states to calculate 1/3-1/2 pound potatoes per person when making mashed potatoes. But I have found people tend to load up on mashed potatoes, especially for holiday dinners. So I always add a few more servings than people. That way there will definitely be enough and leftover mashed potatoes are never a bad thing either. Once they are mashed with butter and milk they even freeze quite well. 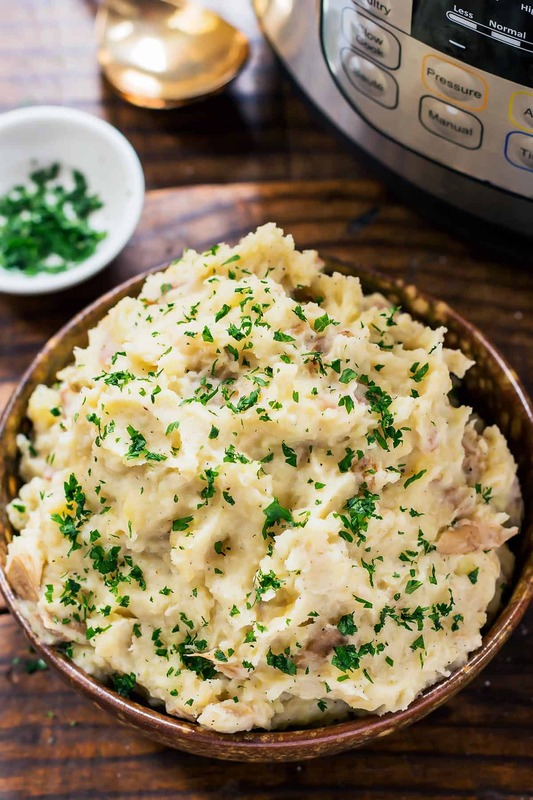 These Restaurant-Style Instant Pot Mashed Potatoes make a perfect side dish for the holidays. Thanks to the keep warm function they can even be made ahead. 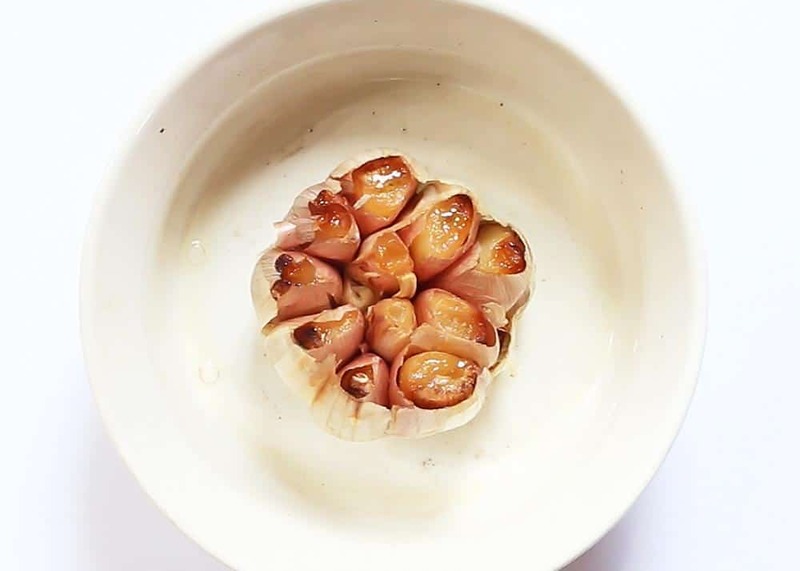 To make the roasted garlic, preheat the oven to 400°F. Peel the outer loose skin from the garlic head while keeping the head intact. Cut off the top part to expose each clove. Place into a small baking dish and drizzle with olive oil. Cover with a lid or aluminum and roast for 40 minutes. When done, remove from oven and set aside to cool. In the meantime, wash the baby potatoes. Use a vegetable brush to remove any dirt and cut off any gnarly bits. 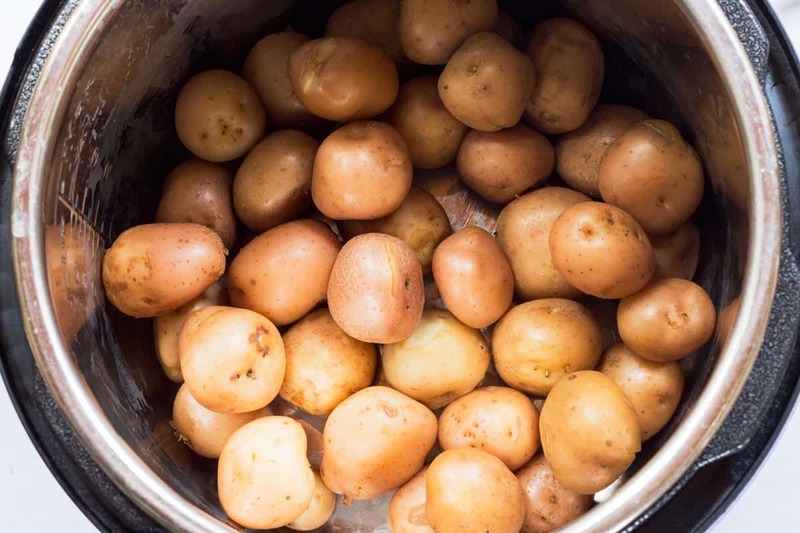 Add the potatoes to the Instant Pot together with enough water to cover the potatoes by 1 inch. Add 1 teaspoon of sea salt. Close the lid and turn the valve to sealing. Selecting the Manual cooking function, pressure cook the potatoes for 10-12 minutes (the latter for high altitude). Once the cooking time is up, let the pressure release naturally (NPR) for 10 minutes, then turn the valve to venting to release any remaining pressure. Using oven mitts carefully drain the water from the inner pot. Add the butter, 2/3 of the milk, remaining 1/2 teaspoon of salt, pepper and the roasted garlic. Use a small knife to pull the soft cloves from its skin. I highly recommend mashing by hand with a potato masher for the fluffiest mashed potatoes. Add the remaining milk as needed for desired texture. You can keep the mashed potatoes in the Instant Pot on the Keep Warm function while you prepare the remaining dinner items. You may double the recipe to make mashed potatoes for a crowd without changing cooking times. The Instant Pot will just take longer to come up to pressure. I only have regular sized Yukon gold potatoes. 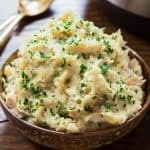 Would this recipe work with the potatoes cut into quarters/approximately the size of baby potatoes? Yes those will definitely work too. Though Yukons usually have thicker skin so I would peel them too. Oh boy, oh boy! I have an instant pot. I have et to make mashed potatoes in it so I really appreciate the instructions. Lots of great hints for cooking great mashed potatoes too. It’s too bad your husband and girl don’t like potatoes! I am the opposite I am all about them! Whenever Dave and I travel to Asia and eat rice as our starch I always miss my potatoes! Also super interested to learn not to ever try making mashed potatoes in the blender! You know we travel all the time so that is totally something I would try too! Will not steer clear of that! Also roasted garlic is the BEST! who would not love this recipe! mash potatoes with garlic! yes, please! Roasted garlic makes everything better!! I agree that a pressure cooker makes it so much easier, even if there isn’t much time savings. I love the set and forget! I’ll definitely be trying this recipe soon in my pressure cooker. Oh wow! I love the addition of the roasted garlic. This sounds like a wonderful addition to the holiday table.